On Sunday night, Ford’s Theater held another of its blogger previews for Liberty Smith, a world premiere musical set to have its official opening at Ford’s next week. I was able to attend the first half hour of the technical rehearsal and started to get a feel for the show. Liberty Smith has a pretty simple concept- what if there was a founding father we’ve never heard of? That would be Liberty, a normal guy who managed to meet most of the key figures in the American Revolutionary War and seems to be responsible for most of it getting off the ground in the first place. Geoff Packard plays Liberty, a tremendously talented actor last seen as the title character in the Shakespeare Theatre Company’s Candide, and it’s great to have him back on DC stages (even if he IS sporting a really unfortunate brown wig as Liberty). 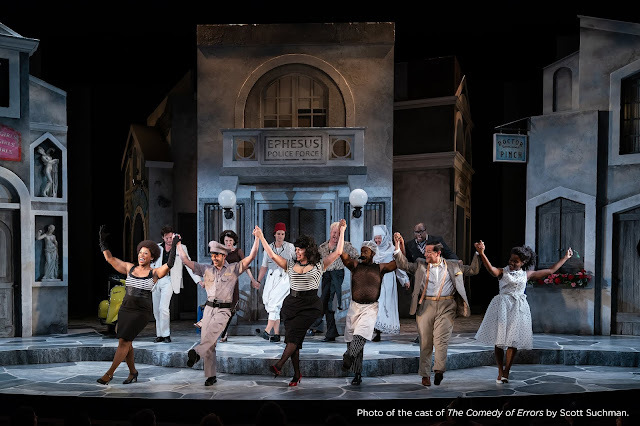 The ensemble features plenty of familiar names from the DC musical theatre scene and the set, by Court Watson, is fun and versatile, with lots of metatheatrical flourishes. Our show is, technically, half play within a play, half... well, play. This painted backdrop is from the framing story: a play about George Washington being performed in the 1800s.